NEW YORK — In 1932, a young photographer named Ansel Adams sought to lay down the law: “the artist must have a clear and complete conception of the final effects of the print before he operates the shutter of his lens’’ (Adams’s italics). That same year, a slightly younger photographer, Henri Cartier-Bresson, took what may be the emblematic photograph of his career, if it isn’t too absurd to reduce a career as fecund and dazzling to a single image. In doing so, he took the law into his own hands. “Behind the Gare Saint-Lazare, Paris’’ shows a man leaping across a puddle. What could be more mundane? Thanks to Cartier-Bresson, nothing could be more magical: the way the man seems to be dancing, the relationship between shadows and reflection, the intricate play of shapes and planes. The real leap is the photographer’s: his ability to capture — so precisely, so rapturously — an instant of action. Kinetic, geometric, humanist: The elements that would define Cartier-Bresson’s work for more than half a century are all on display here. For Adams, time (like so many of his finest photographs) was geological. Time meant something else for Cartier-Bresson: the beat of a heart, the blink of an eye. Yet “Henri Cartier-Bresson: The Modern Century,’’ which runs at New York’s Museum of Modern Art through June 28, has one thing in common with MoMA’s superb 2003 retrospective “Ansel Adams at 100.’’ Both present a photographer who long ago became so reflexively canonical as to be taken for granted — and remind us in thrilling detail just why each became so canonical. Few artists contributed as much to the visual texture of the 20th century. Cartier-Bresson was responsible for at least two dozen images that any reasonably observant person would recognize. That person likely doesn’t know their titles or the identity of the man who took them. But that’s the point. Cartier-Bresson’s puddle-jumper; the corkscrewing cyclist in “Hyères, France’’; the accused Gestapo informant in “Dessau, Germany’’; the mother and son reunited after World War II in “New York City’’; the portraits of Matisse with his pigeons, Faulkner with his dogs, Sartre with his pipe: They long ago achieved the anonymity of universality. If there’s such a thing as a collective artistic unconscious, Cartier-Bresson was among its most lavish contributors during the last century. What he saw became what millions have seen since. All of those images are in the show. It’s a mark of the exhibit’s richness that while nearly as many famous Cartier-Bresson images are not on display at MoMA, their absence goes unnoticed. There are more than 300 photographs in all. A fifth have never been seen in public before. Both figures are startling. Even more startling is another: 500,000. That’s how many frames Cartier-Bresson exposed over the course of his career. The show begins chronologically and then, quite sensibly, becomes thematic. The ticking of the clock matters less than the furnishings of the room in which it hangs. The themes may be geographic (Asia, France, the United States, the Soviet Union), generic (portraits), or preposterously porous (“Beauty’’? “Encounters and Gatherings’’?). What unites them — what exalts them (not too strong a verb) — is one man’s eye. “Monet is only an eye,’’ Cezanne is said to have remarked, “but my God, what an eye!’’ So, too, with Cartier-Bresson — except that the eye came attached to a superlative set of reflexes, as well. “The great pleasure for my Leica,’’ he once said of using the lightweight camera, “was to have the spare elements of a collage suddenly jump from the street into the lens.’’ Cartier-Bresson did not create the elements that went into making the collage, but in the act of recognizing them he created it. His scenes are so often busy, but never, never cluttered. The eye that detected also, miraculously, managed somehow to organize. 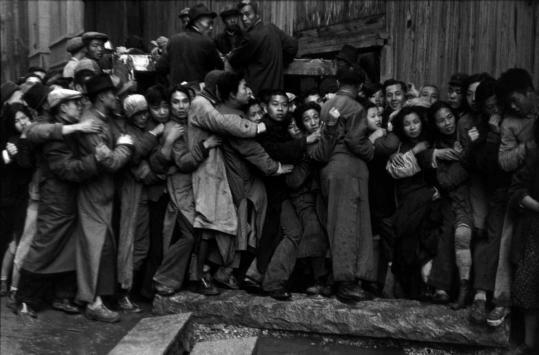 The classic instance is Cartier-Bresson’s photograph of people fighting to get into a bank in Shanghai during the Chinese civil war. It doesn’t just resemble a frieze. It resembles a frenzied frieze. If the picture were in color, you’d assume someone like Jeff Wall or Gregory Crewdson had staged it, the arrangement is that perfect. Of course, it wasn’t staged. That perfection was the intersection of chance — Cartier-Bresson’s fabled “decisive moment’’ — and camera. Even the most teeming scene, his camera somehow arranged. The teeming becomes Cartesian. He was a humanist, yes, but a formalist humanist — and vice versa. The ability to maintain two such normally opposed sensibilities was a phenomenal strength. It’s rather wonderful to observe how an artist with a unique ability to consistently impose visual order had his artistic roots in the irrational. Surrealism, with its love of the incongruous and improvisational, deeply informs Cartier-Bresson’s ’30s work. With their almost-acrobatic rearranging of picture planes, some of the photographs he took in Spain and Mexico are as disorienting as anything Dali or Magritte painted. Wash hanging on a line, in a picture from 1931, has the silhouette of a creature from a Max Ernst canvas. Perhaps not even Cartier-Bresson himself could say if Ernst was on his mind when he took that photograph. Surely, though, he was aware how much the snow-covered roofs in “Rudesheim-am-Rhein, Hesse, West Germany,’’ from 1956, recall Brueghel. It’s a doubly arresting image: both for its intrinsic beauty and for its anomalousness within Cartier-Bresson’s work. Its presence underscores how rarely one sees the influence of previous visual art on his photographs. It’s true that he studied painting with Andre Lhote and eventually gave up photography for drawing. But in between came a striking photographic purity, all the more striking for Cartier-Bresson’s being such a cultivated man. Here perhaps was his essential modernity, the truest source of that “modern’’ in the exhibition’s title. What mattered most to Cartier-Bresson was what was actually in front of him, not any pictorial tradition behind him. If Cartier-Bresson had taken no photographs after, say, 1936, he’d still have an honored place in photographic history. It looked for a time like those would be the only photographs he’d take. He turned to politics, working for the Popular Front. He made three documentaries about the Spanish Civil War and was an assistant director for Jean Renoir (Cartier-Bresson has two lines as a butler in “Rules of the Game’’!). He served in the French Army and, after several attempts, escaped from a German prison camp. Cartier-Bresson was already a traveler. Photojournalism made motion part of his job description: a restless life, a restless eye, in constant pursuit of instances of perfect stasis. Outside the galleries are five large maps, themselves things of considerable beauty, tracing his numerous journeys. Is there anywhere the man didn’t go? Along with Moscow and Delhi and Ulan Bator, there is even, yes, Boston (men sprawl on the Common during a heat wave in 1947). Peter Galassi, MoMA’s chief curator of photography and organizer of the show, describes Cartier-Bresson’s photojournalism as “broad reportage.’’ That has it just right. The occasional news event (Gandhi’s funeral, François Mitterand’s inauguration) crops up, but what Cartier-Bresson sought transcended any standard definition of journalism. The exhibition includes several display cases containing vintage magazines with Cartier-Bresson’s work for them — Life, Harper’s Bazaar, Paris Match, Der Stern, Vogue, and so on. Their presence serves an obvious archival purpose, yet also an aesthetic one. They seem so flimsy and inconsequential compared to the framed and matted prints hanging above them. So much of the appeal of photography has to do with its capacity to render pastness, and so much of the appeal of photojournalism has to do with a specific aspect of that, a capacity to render a here and now — or, rather, a there and then. Again and again, we see Cartier-Bresson reaching beyond either, going straight to the eternal. In that sense, he was as much Pascalian as Cartesian. “The heart has its reasons,’’ Pascal wrote, “reason knows nothing of.’’ So, too, does the eye.